Too often in today’s climate, Christians are known more for these things than we are for anything else. Whatever the current news cycle is, there’s something that has offended us enough for us to tell the world how offended we are. The latest in this cycle of the Offended Church of America (OCA) is a football coach in Washington state getting suspended (with pay!) for disobeying his public school district’s ruling against praying on the field. A Christian man took a stand against secular rules and was forced to pay the consequences. Instead of cheering this coach on for standing up for Jesus in the face of opposition, the OCA responded like we always do: with outrage, hashtags, and viral complaining towards the school district. We, the Offended Church of America, act as if its our right to practice our beliefs in front of everyone at all times and are offended when others feel differently. 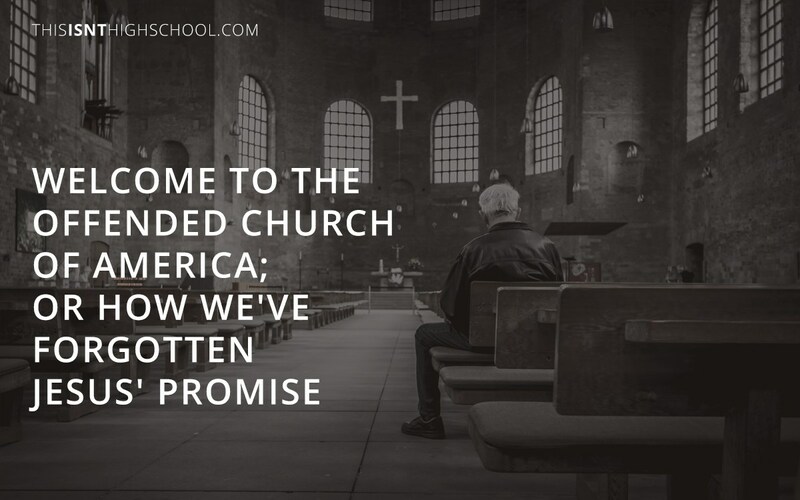 For some reason, we think the promises of Jesus, Paul, John, Peter, and James don’t apply to us as Americans. While God himself promised there would be suffering and hardships and that people wouldn’t like us, we think that doesn’t apply to us because we live in His chosen country of the United States of America. In case it’s been forgotten: the Gospel has never and will never be socially acceptable. At no point in time has the Gospel been anything but radical, counter cultural, and at odds with everything else in the world. Praying publicly after a game is offensive to people. Taking a moral stand on sexuality is offensive to people. Having a set of beliefs and convictions is, you guessed it, offensive to people. We are aliens in a foreign land. We are not normal nor are we ever going to be accepted. Instead of fighting against that, we must not only accept it but also embrace it. We have to stop getting offended when people treat us differently or call us names. Jesus told us that would happen. Do we stand up for what’s right? Or do we get offended by what’s wrong? Some would argue these two things are not mutually exclusive. While that’s correct, one or the other will always be our priority. I would much rather spend my time pointing people to Jesus, calling out the hope we have in him, than being offended because a sinful world is sinning. I would rather be known by what I am for instead of being known by what offends me. My hope is that the Offended Church of America loses many of its members to the Church of Jesus. He never called us to be offended. He called us to be light in the darkness. Coach Kennedy chose to be that light and is now suffering the consequences. Whenever we stand up for Jesus, there will always be opposition and many times negative consequences. Jesus told us we could have courage in these situations because while it may be hard now, in the end, he’s already won. This world has enough people getting offended by every little action and reaction. What it needs is more courageous Christians who will stand up for Jesus in the face of potential suffering. So will you be known for standing up for what’s right or for getting offended by what’s wrong?